Eilean Donan castle was founded in the thirteenth century, and became a stronghold of the Clan Mackenzie and their allies the Clan Macrae. In the early eighteenth century, the Mackenzies' involvement in the Jacobite rebellions led in 1719 to the castle's destruction by government ships. Lieutenant-Colonel John Macrae-Gilstrap's twentieth-century reconstruction of the ruins produced the present buildings. 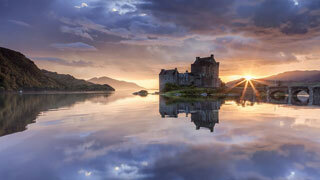 This article uses material from the Wikipedia article "Eilean Donan Castle", which is released under the Creative Commons Attribution-Share-Alike 3.0 License.